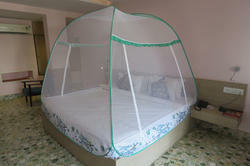 We are a leading Manufacturer of foldable mosquito net - 120x192 cm, folding self standing mosquito net, folding self standing mosquito net bed canopy and foldable mosquito net - 160x192 cm from Surat, India. Folding, Auto Pop-up, self Standing, light weight and highly portable mosquito net supplied with a Zipper Non woven carry bag. Highly retractable character and very high quality of steel wire frame provides very easy and effortless folding of a mosquito net. 2 (Two) Large opening zipper gates provides easy and comfortable communication on the bed. Enables folding and unfolding in few seconds. Weaving of net allows maximum air breeze inside the canopy which makes the net highly ventilated and comfortable with high air breeze. Dimensions - 120 x 192 x 130 Cm Height. Weight - 1.3 Kg. 100% guaranteed for the size as described unlike the other sellers. Also 100% guaranteed for breakage of the frame for 365 days after the date of sell. This range offers ultimate protection against mosquitoes and dirt in outdoor and other such locations. It is well-tested on several quality parameters. ,folding and self standing ,auto pop-up type opening ,folds and unfolds very easily in seconds ,very light weight- approx. 1.3 Kg. 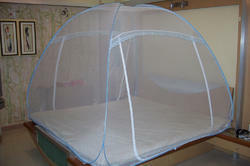 ,super finished ,easily portable for outdoor use ,well air ventilated ,sufficient height to provide spacious roomy feel ,guaranteed for breakage of frame ,very stable to stand upright in balanced condition ,large opening 2 gates with every size of mosquito nets ,longer life ,user friendly design ,proven quality by more than 19000 satisfied users in India. Supplied with a zipper carry bag. Our sizes are suitable to almost every size of beds. Easy to wash.
100x192 Cm., 120x192 Cm, 160x192 Cm.,180x192 Cm., 200x200 Cm. 3 (Three) Large opening zipper gates provides easy and comfortable communication on the bed. 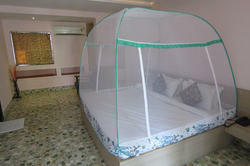 Special anti bite design provided by stitching solid printed satin fabric borders stitched on 4 sides with mosquito net. Enables folding and unfolding in few seconds. Weaving of net allows maximum air breeze inside the canopy which makes the net highly ventilated and comfortable with high air breeze. 200 x 200 x 155 Cm Height. Weight - 1.8 Kg. Folding, Auto Pop-up, self Standing, light weight and highly portable mosquito net supplied with a Zipper Non woven carry bag. Highly retractable character and very high quality of steel wire frame provides very easy and effortless folding of a mosquito net. Additional separate steel wire ring provided to install at top of the net to keep 4 corners apart, forming broad roomy feel. Folding, Auto Pop-up, self Standing, light weight and highly portable mosquito net supplied with a Zipper Non woven carry bag. Highly retractible character and very high quality of steel wire frame provides very easy and effortless folding of a mosquito net. Dimensions - 160 x 192 x 140 Cm Height. Weight - 1.3 Kg.